What do you do when your nest doesn’t just empty, it falls out of the tree? 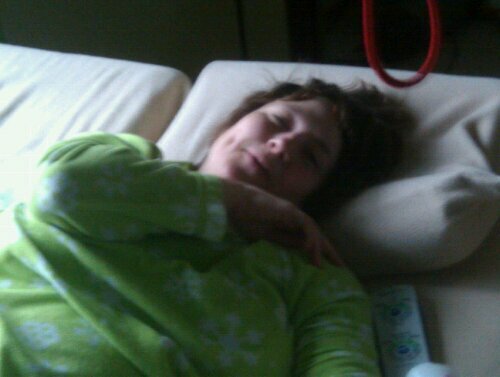 My sister, D'Ette, on the morning in question. Notice the big dimple. My nephew Daniel graduated high school recently back in my hometown of Bowman, N.D., and I decided to drive 12 hours to be there because it wasn’t just that my sister’s youngest was leaving the nest. But we’re not just talking about empty nest syndrome: Over the course of a year, her whole nest has been upended and is precariously close to falling out of the tree. Let me explain: My sister D’Ette has two children and up until last year, she was married. Then her husband left her for one of her best friends. He was No. 1 on D’Ette’s speed dial, she was No. 2. But this is not your typical divorce: D’Ette is severely handicapped. When Jeff and D’Ette got married, she was still able to walk – although people thought she was drunk because she stumbled from one side of the hallway to the other as she made her way through Bowman High School – always with a big, contagious smile on her face. She couldn’t walk a straight line, but she went out for gymnastics anyway and eventually became the team manager – cheering me on from the stands. They were love-drunk so they got married and Jeff didn’t worry about what the future might hold. They had two children who – as D’Ette’s friend likes to say – are made of pure gold. Blond-haired angels who make me sick, frankly, because they’re damn near perfect. But D’Ette’s disease – the same disease two of my other siblings have/had – just gets worse. It does not get better. And so she went from walking when she married to using a wheelchair and her muscles – all of her muscles – just got weaker and weaker. And you know I understand it has to be hard to go from husband to husband/caretaker. I get that. People probably thought Jeff was a martyr for sticking with her for more than 20 years; I think he just got tired. My sister D'Ette and her daughter, Hope. Or as I call her, Hoprah. So anyway, she lost Jeff, and her oldest daughter, the appropriately named Hope, went to Guatemala on a mission trip last year and fell for a Guatemalan named Rudy. They will be married next month and she will graduate college in a year. And then Daniel graduates and will leave home at summer’s end. And suddenly the woman who has long prayed that she would live long enough to see her daughter marry or her son graduate high school (many people with this disease don’t) is about to see it all happen within the space of two months. And then they’ll all be gone. She lives in a gray ranch house in Bowman that bears the scars of a woman in a wheelchair: every door has been banged up and scratched by her wheelchair – some even have holes punched into them. Doorways were widened and sinks were lowered and equipment installed to make it a home she can live in – with help. At Daniel's open house. 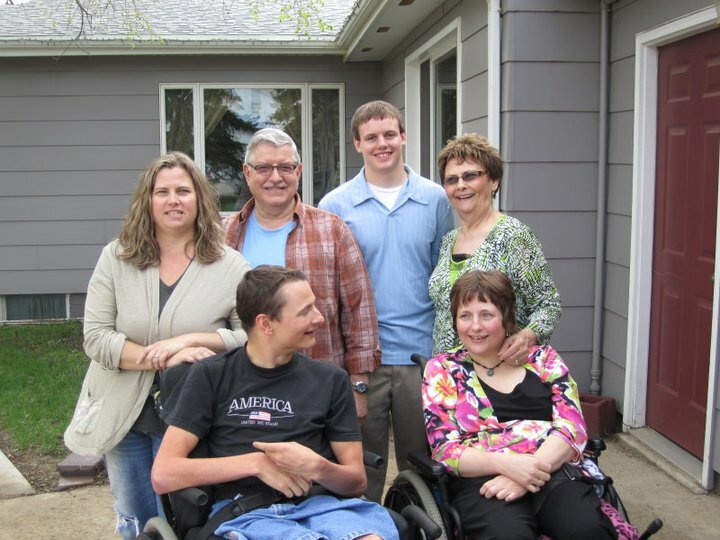 Me and my parents and Daniel are standing, my brother Dusty and sister D'Ette are in the wheelchairs. However, since she received some money in the divorce, she has assets and therefore the government decided she doesn’t need their help anymore. So she pays people $10 an hour to come help her – but in a state that’s booming with oil, it’s hard to find anyone willing to take a job like that. Much less someone who’s really good at it. And so workers come and go and sometimes they steal from her and sometimes they just don’t treat her with the dignity she deserves and right now she’s struggling to find anyone who will come. So I figured I’d at least come and help her for awhile as she goes through one of the toughest days of her life. She pretty stoic about all of this and she’s determined to defy the degenerative nature of her disease, Friedreich’s Ataxia, by trying to do things she cannot do: Like sit up in bed. Think about that: You and I, when we sleep at night we toss and turn to stay comfortable. She can’t really even do that. And when she wakes up and has to pee, she can’t jump up and run to the bathroom. She’s been preparing to live alone in that house, so she bought a mechanical lift system that is attached to the ceiling in her bedroom and bathroom. A remote control lowers the lift, she hooks it under her legs, and it lifts her up in the air and carries her from her wheelchair to her bed or toilet. Sounds pretty simple. Takes me about two minutes to get her in and out of it. Takes her about 20 minutes – and then there’s always the possibility she’ll fall out of it. She does that sometimes. I don’t even want to picture her home alone falling out of that contraption – but when you’re handicapped you get used to face plants and black and blue marks and many other indignities. She’s got her house rigged up so that if she has to, she can try to live on her own. Ideally, she’d have help getting out of bed, going to the bathroom, bathing, cooking, cleaning and getting back in bed. And all those thousands of things we do in between. She’s still got that steely resolve that propelled her to try out for gymnastics, but sometimes she crumbles, and when she cries, she doesn’t just cry, she bellows. Whereas you and I would be able to stifle an urge to cry and nobody would ever notice, she erupts into a full-throated wail. Which is why I didn’t really want to sit anywhere near her during Daniel’s graduation, but I did, and she only erupted like Mount Saint Helens a few times. One of those times was the part of the ceremony where they’re just trying to make parents cry by having each graduate bring them a single rose. Well, hello, I figure she’s going to fall out of her chair bawling when her Daniel comes walking over to her with a big grin on his face — he doesn’t look embarrassed at all of his mom, who is falling apart right there on the gymnasium floor. But she makes it through the ceremony and during Daniel’s open house, she positions her wheelchair by the door and surveys the scene from there – smiling even though she’s on the verge of having another good cry. One morning while I was staying with her, I awakened to the sound of D’Ette talking in her bedroom. So I went in to see if she was calling me or something, and found her lying in bed with the morning sun shining on her face (she refuses to put up drapes) and a big smile on her face. “Just talking to God – thanking him for this beautiful day,” she said, grinning. There she lay, a 45-year-old woman wearing an adult diaper, unable to run to the bathroom and pee, unable to go for a morning run or type on a computer or bake a cake or drive a car or climb a molehill, much less a mountain. Unsure what the future might hold for her, unable to figure out what to do now that her nest was empty. I suddenly felt very ashamed about all the times I complain about having arthritis or that annoying ringing in my ear or my foot injury or bills or jobs or who said this or that or the other thing. I can go for a jog. My God, I can do a cartwheel. This is an inspiring post Deena, thanks for sharing it. WOW Denna, great story, makes one with little aches and pains see life differently. May God bless your sister and her fight. She seems like a pretty special person! Brilliantly told, Deena. Thank you for letting us share in the strength and beauty of your sister – and your love for her. Thanks so much for sharing. D’ette is a most beautiful, loving and wonderful person to know. I have only met her on a few occasions, but she is always smiling. Just as with Dusty, I am believing that this disease will stop it’s rampage on their bodies and that healing will take place. They and your family are a true sign of grace in the midst of a storm. Thanks for sharing. Very well written. Dena, You are the best writer and should be writing a book about your family. Your sister is such an inspiration!! Wow!! To lose your husband and best friend. Double whammy. I look forward to your blogs everyday. You are the best!! D’ette has true faith. If only each of us would wake up every morning and thank God for the sunlight and the new day he has given us. Brought tears to my eyes Deena. Some days I complain about my full nest and the husband that left me to go have fun and be selfish. Your sister is an inspiration of strength and being thankful for what we have. Thank you for sharing her story. I love hopes mom…shes a saint a deserves a happy life. All TRUE! Thanks for writing this Deena. I’m glad you (and Mom, Dad & Dusty) could be there for her. The next time I’m feeling sorry for myself, I’m going to remember this post. Thanks for sharing your sister’s story with us Deena. This popped up with Hopes name on my facebook this morning. I met the lovely Hope three years ago and am so blessed to be her friend 🙂 And I had the joy of visiting with D’ette for the first time a week ago 🙂 She is one of the most Spirit-filled women I have had the pleasure of spending time with and I was so blessed by her company that afternoon! I look forward to visiting again, hopefully with Hope and Rudy home! Thank you Deena, sharing this on FB & Twitter. Your family is very special. I so appreciate you writing this tribute to D’Ette!! She has always inspire me to reach beyond my comfort zone and do my Best!! I think she was one of my cheerleaders when decided to become a nurse! I love Nursing! !